The NCAA Tournament kicks off this afternoon. There’s no better place to watch all the action then at East Village bar Standings (43 East 7th Street). Even if college bball isn’t your thing, they’ll be serving free pizza for lunch at 1:00 PM today and tomorrow. 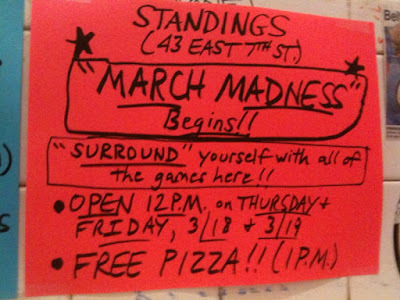 I’ll be honest though… even the best Cinderella story can’t beat the excitement surrounding Slice’s March Madness Pizza bracket (see What “Pizza Madness 2009” Was All About). I met Adam from Slice back at a pizza meetup in October, shortly after he’d gotten the news that he’d be flying around the country to try different pizza places for an article in Every Day with Rachael Ray. The feature came out great and it’s the exact type of trip I’d love to plan around the country.